It’s August 19, 1884. The consumptive Doc Holliday is preparing to await his end in a sanitarium in Leadville, Colorado, when the medicine man Geronimo enlists him on a mission. The time the great chief has predicted has come, the one white man with whom he’s willing to treat has crossed the Mississippi and is heading to Tombstone—a young man named Theodore Roosevelt. The various tribes know that Geronimo is willing to end the spell that has kept the United States from expanding west of the Mississippi. In response, they have created a huge, monstrous medicine man named War Bonnet, whose function is to kill Roosevelt and Geronimo and keep the United States east of the river forever. And War Bonnet has enlisted the master shootist John Wesley Hardin. So the battle lines are drawn: Roosevelt and Geronimo against the most powerful of the medicine men, a supernatural creature that seemingly nothing can harm; and Holliday against the man with more credited kills than any gunfighter in history. It does not promise to be a tranquil summer. "Resnick has done his research, and fast guns, fast plotting, and a comfortably entertaining writing style make this novel a rollicking western with a steampunk tweak." 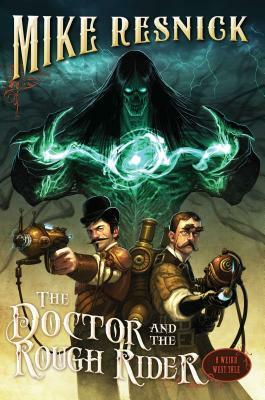 "A fast, fun, and often-amusing tale where Wild West meets steampunk. . . . Told in a spare style reminiscent of a tale told round the campfire, The Buntline Special has a mythic feel. It's a modernday tall tale with the requisite larger-than-life characters." "With great relish Resnick subversively refurbishes this notorious collection of fact and embroidery. . . .Clever and refreshing." "Brilliant. Scary, funny, often very moving. Left me wishing I could have shared a couple of whiskeys with Wyatt and Doc."